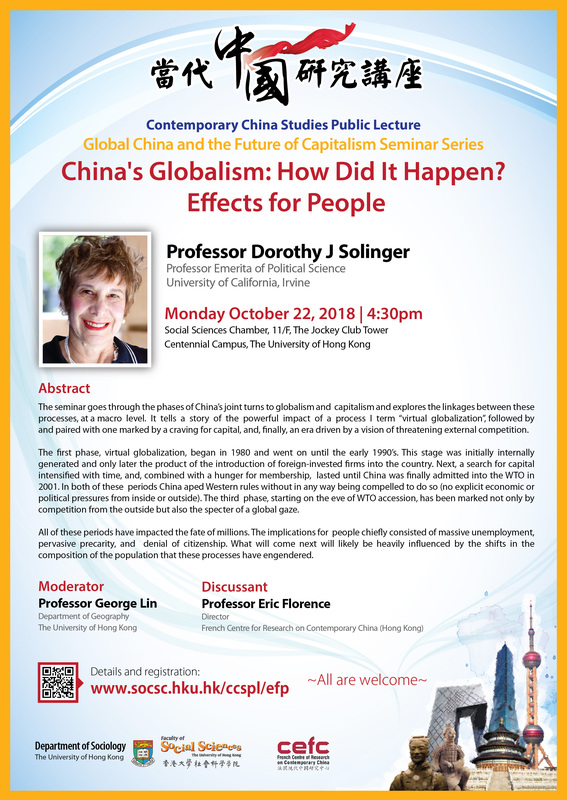 Prof. Dorothy J Solinger, Professor Emerita of Political Science, University of California, Irvine. The seminar goes through the phases of China’s joint turns to globalism and capitalism and explores the linkages between these processes, at a macro level. It tells a story of the powerful impact of a process I term “virtual globalization”, followed by and paired with one marked by a craving for capital, and finally, an era driven by a vision of threatening external competition. The first phase, virtual globalization, began in 1980 and went on until the early 1990’s. This stage was initially internally generated and only later the product of the introduction of foreign-invested firms into the country. Next, a search for capital intensified with time, and, combined with a hunger for membership, lasted until China was finally admitted into the WTO in 2001. In both of these periods China aped Western rules without any way being compelled to do so (no explicit economic or political pressures from inside or outside). The third phase, starting on the eve of WTO accession, has been marked not only by competition from the outside but also the specter of a global gaze. All of these periods have impacted the fate of millions. The implications for people chiefly consisted of massive unemployment pervasive precarity, and denial of citizenship. What will come next will likely be heavily influenced by the shifts in the composition of the population that these processes have engendered. The seminar was held in English. This seminar is the fourth of the “Global China and the Future of Capitalism Seminar Series” being held in 2018 and 2019. The concept note is available here.